While working on the Mellon Farm, one of the main buildings for surviving the zombie apocalypse of Deadmonton, I realized the Fort Deadmonton section doesn't have an overview page for the street it resides on. I'm currently doing that now. Or, at least, half of it. 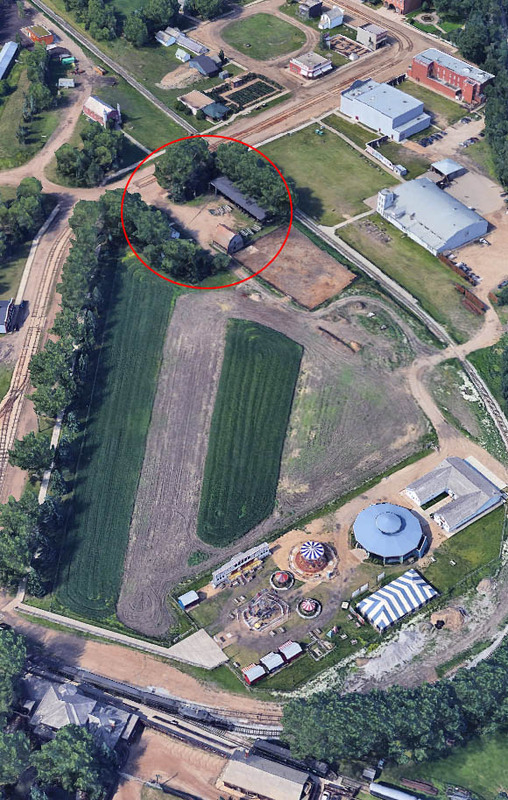 To get a better understanding of what I'm talking about, go to the Fort Deadmonton map page and download the Fort Edmonton Park map, link is at the top. Fort Edmonton's 1920 Street spans a good deal of the park, encompassing the 1920's Midway & Exhibition (bottom-right in picture below), all the way to Hotel Selkirk (top-right). There are a lot of buildings along that stretch. So the street will be broken up in two, the first part, will be the stretch starting from the Mellon Farm (circled in red) and ending at Hotel Selkirk. The second section will be made at later point and will include the 1920's Midway up to the Motordrome (you can see a part of the Motordrome on the left side, about half-way down). Fort Edmonton Park 1920 Street. Image copyright Google. The first section of 1920 Street overview should be completed by this time next week. I'll send out a tweet when it is ready to view, so follow Deadmonton on Twitter for quick news.